Man ju was studying in class VIII or so when she started coming to our ashram. Her village Dungri is not far from Ranchi Sanatorium. Along with the other girls and boys of her village, Manju would also participate in different functions. She had great admiration for Swami Vivekananda. As she grew up her admiration for Swamiji turned into devotion. It was during one of those days of the severest spell of winter that I went to her village to explore certain welfare activity. On the way while we were walking through the muddy road I saw little Manju standing outside her home. She was visibly pleased. She requested me to come into her house to which I agreed to fulfil her desire on my return trip. When I went to her house I was as usual flocked with elder people of the village. With great happiness writ large on her face, Manju took me first to a room where on a shelf near the window, the photos of Holy Trio were kept. Flowers had been offered. When I made my pranams, it occurred to me that I should humbly place before the photos some pranami. In my pocket I had three notes of hundred rupees. After offering the cash there, I returned after taking the tasty milk-free liquor tea. Manju was again keeping silent. It is anybody’s guess that what a 14 year old girl would spend the money for. How many things are there that she could purchase bangles, cosmetics and what not. What she told me at that juncture simply stunned me. Imagine a little girl like Manju not spending the money on herself but going out of the way in doing something else. Did not Swami Viekananda say, “They alone live who live for others?” I was amazed at Manju’s expansive heart, the centre of which transcended her small body-mind complex and embraced the socalled unrelated ‘others’. Manju is a perfect example of “Compassion in Action” by displaying her benevolence and kindness to the little children. By doing good to others we do good to ourselves!! It is so touching to note that how the three hundred rupees was used at the right place, at the right time and to the right persons. She brought warmth and cheer to the little children… So wonderful!!!! 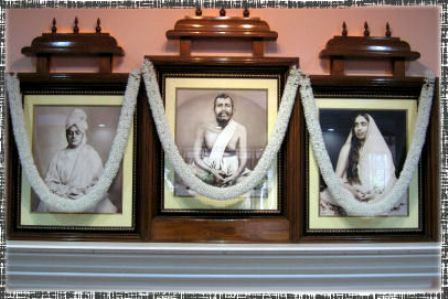 May Swamiji imbibe HIS strength in Manju and make her life divine ……. This world is so full of greed and materialistic gain – it is good to know that people like Manju still exist in and amongst us. Such positive behaviour needs to be encouraged in our current society. A perfect example of “right activity”. May she be blessed with divine guidance. Revered Swamiji, Om Namo Narayanaya! Pranams at your Lotus feet. Thank you for sharing this inspiring message. When we live for others, others live for us. When we live for ourself, nobody is interested in us. This is indeed such a heart-touching incident which you have recounted here. The earth is a place worthy of living because there are still such ‘Manju’s. May the number of such ‘Manju’s go on increasing exponentially. Thank you for the sincerity in your tone of appreciation! Yes, our country was famous for self-denying persons who were noble-minded. Today we do need such individuals who live their lives for “others”.